My family spent a few days down in the Mount Brandon Hotel in New Ross this week, and after dinner on Wednesday night I noticed a Give Blood Clinic was open. Some members of my family have had their lives saved thanks to people who have donated their blood. This was an opportunity for me to give some back. 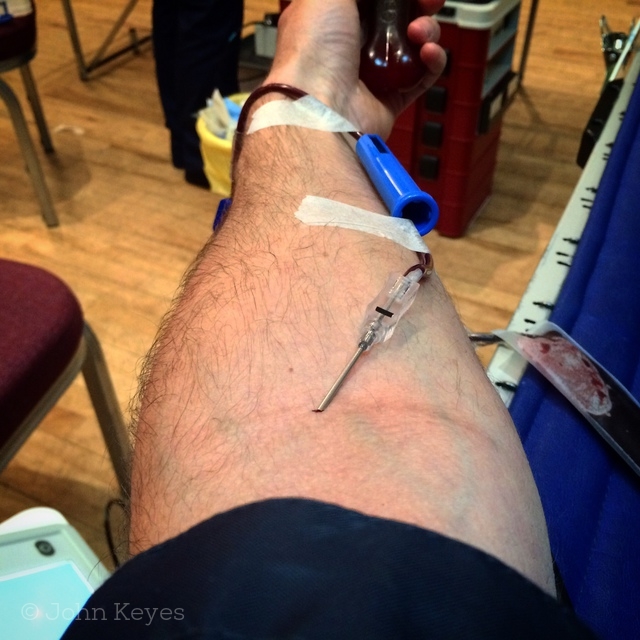 The last time I donated blood was about twenty years ago. Willie O’Keeffe, a veteran of over fifty donations, brought me into St. Stephen’s school in Waterford. I don’t remember too much about the day, but I’m fairly sure I had a glass of Guinness to aid recovery. The large room where the clinic was being held was pretty full. I joined the queue of other donors and one of the nurses informed us that it would take about two hours in total. I thought it might take about half an hour, and with two kids upstairs wondering what the hell their Dad was doing, I briefly contemplated walking out. They arrived down with my book, and my son (five years old) said he’d give some blood too. After telling him I’d bring him a keyring when I was finished, he was happy enough to leave me to it. A quick registration process followed, and then I was in another queue, for the haemoglobin test. I thought this might be a blood prick test (or similar), but it was even more straightforwad than that. I simply had to put my finger into a device with a rubber sleeve, and that was that. It didn’t take very long, and then I ended up in another queue to await an interview. First time donors, and those who haven’t donated for over two years, must go through this interview process. Prior to the interview, I had to fill out a questionnaire (yes/no answers), with questions about my health, travel, and sexual activity. The interview consists of a review of this questionnaire, and then signing a declaration that basically I understood all the questions, and that I accept how my blood could be used. After the interview, I joined the donation queue, and had a couple of glasses of water. I then spent maybe thirty minutes reading about Stephen Fry’s sugar addiction, before I was called to donate. The procedure itself is fast. I was giving a large plastic bone to squeeze, and then they swabbed the area, inserted the needle, and let me lie there while the bag was filled. I’d say it took about five minutes to fill the bag. An audible alarm signals when the bag is full. The needle is removed, a plaster applied and then off you go for some goodies. A glass of 7-Up and a few Bourbon Creams and I was out the door. Most importantly I didn’t forget to bring two keyrings back to the room with me.